I don't know how long this has been around, but just today I noticed that Google Maps has a built-in feature for calling businesses - for free. 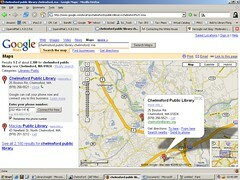 When you search for a business in Google Maps, say, the "Chelmsford Public Library, Chelmsford MA," Google will display the location on a map, as well as list on the left the name, address and phone number of matching business/organizations. Next to the phone number, though, there's a "call" link which I never saw before. Clicking on it opens a box into which you enter your own telephone number. When you click the "Connect for free" button, the service will call your number, and when you answer, automatically connect you to that business' phone number. And best of all, Google pays for the call (if you're using a cell phone, you still pay for your airtime). I've heard of internet calling before, but never saw it so seamlessly and usefully integrated. Of course you have to type in your own number, and hope that Google keeps their promise of protecting your number. For more about this service, see Google Maps' help page. Posted under Library, Resources on Thursday, December 28th, 2006 at 12:47 pm, by Brian Herzog. Post and comments available via the RSS 2.0 feed. Both comments and pings are currently closed.